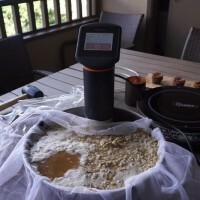 Lots of unusual ingredients are used in making beer, especially by us homebrewers. So it’s really no surprise that oysters—the kind from the ocean, not the Rocky Mountains (although that’s happened, too)—eventually made their way into the brew kettle. It may sound repulsive, but the results can be far more pleasant than the smell of low tide on a hot day. In Victorian-era England, oysters and beer were a common food and drink pairing. Mollusks and other shelled seafood were fairly cheap in these times, and “stout porter” was overflowing mugs at local taverns. It seemed a match made in beer-heaven, with the sweet and salty oysters balancing the roasty and smooth characteristics of the dark brews. Eventually the oyster shells made their way into the brew kettle, likely to promote clarity, but it also enhanced some of the beer’s bitter flavors while creating a softer mouth feel. It is said whole oysters—meat and all—were first being used by brewers in New Zealand in the early 20th century. Since then, the briny and minerally ocean-qualities have picked up quite a following among beer brewers and drinkers. These days, the salty mollusks are used primarily to brew oyster stout. The style characteristics vary widely, concerning everything from the base style to the parts of the oyster used. 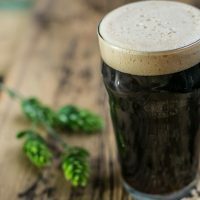 For the homebrewer, it is suggested to pick a tried-and-true stout recipe that you are confident in. Based on the recipe specifications, you can start to determine the best way to instill briny characteristics through various possible oyster additions. If brewing something like an oatmeal stout with big bold flavors, consider using all parts of the oyster: shells, meat and brine (the liquid inside oyster shells, sometimes called “liquor”). Using all components will add the briny, sea-water qualities while the meat can soften up the mouth feel. 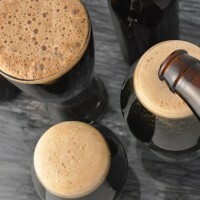 If brewing something a bit more subtle like a dry stout, just using the shells might be wise to instill some salinity without making it unpleasantly salty. The amount of oysters used all depends on the base style, as explained above, and the desired amount of oyster characteristics. Some commercial brewers use one whole oyster per barrel, while others use one pound of oysters per barrel. Oyster character is typically very subtle, but adding too much could leave you with a beer more reminiscent of fish soup, though this would take a lot of oysters. If brewing a five-gallon batch of oatmeal stout, start out with 0.5-0.75 pounds of shucked oysters, and adjust future recipes to fit your desired taste. If brewing dry stout of the same volume, start with a dozen or so oyster shells. Oysters are typically added to wort during the boil. As a precautionary step, it’s highly recommended to add the oysters with at least 10 minutes left in the boil in order to cook them fully. Many brewers will add the shells right when the boil gets going and the meat and brine towards the end of the boil. That’s it! Go get yourself a bucket of oysters, a shucking knife and glove and have an oyster stout brewday party. But be sure you don’t serve a pint to your friends with shellfish allergies! 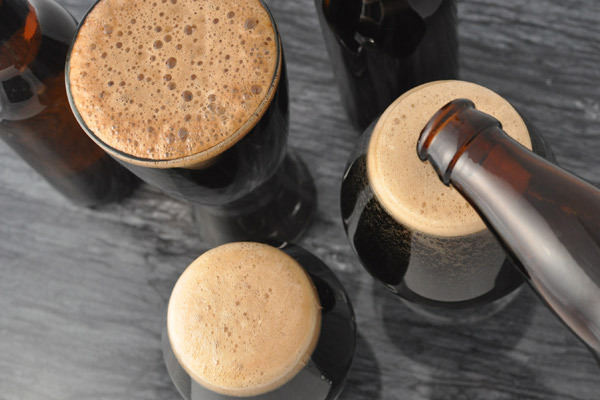 For more information on brewing beer with oysters, including oyster stout recipes, read J. Wilson’s article “Pearl’s of Wisdom: Brewing Oyster Stout” in the March/April 2014 Zymurgy. 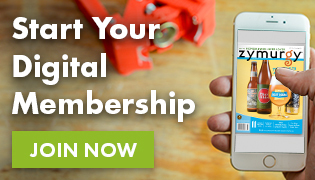 Access Zymurgy instantly online or on your mobile device!